On January 18th, 2019, Foshan's first e-sports industry bench-marking project, namely e-sports Cultural and Creative Industry Center of Guangdong-Hong Kong-Macao Greater Bay Area (hereafter referred as e-sports Industry Center) was launched. With a planned investment of 2 billion yuan, the e-sports Industry Center will be completed into the national A-level e-sports hall, linking upstream and downstream resources to form an industrial cluster. The project will strive to become a gathering place for e-sports industry and high-tech talents in the Guangdong-Hong Kong-Macao Greater Bay Area. The e-sports Industry Center is situated in Sanshan New City, Nanhai District. Jiang Xiaofei, representative of the operating agency of the e-sports Industry Center, said that relying on the industry and location advantages, the project will become an innovative highland that leads the integration of e-sports industry and a demonstration zone of economic and cultural cooperation and exchange in the Guangdong-Hong Kong-Macao Greater Bay Area. 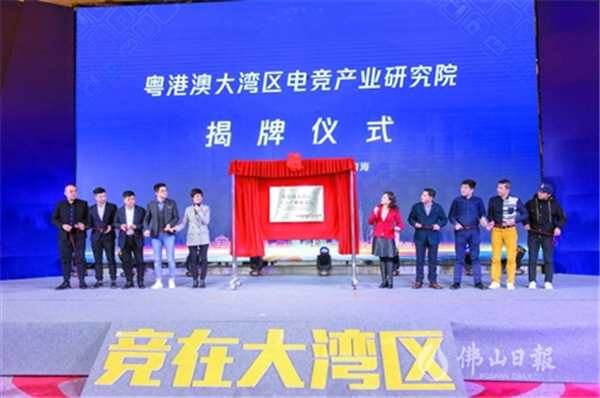 On the same day, the first e-sports Industry Research Institute of Cultural and Creative Industry Center of Guangdong-Hong Kong-Macao Greater Bay Area was established. In the future, the e-sports industry research in the Guangdong-Hong Kong-Macao Greater Bay Area will be carried out to provide intellectual support and services for e-sports enterprises and industries in the Guangdong-Hong Kong-Macao Greater Bay Area. The data shows that the game revenue of Guangdong Province reached 181.1 billion yuan, and the number of online game companies in the Guangdong Province reached 7761, of which 22 were game companies in Foshan. In recent years, Foshan is committed to promoting the development of the cultural industry. Foshan government has introduced relevant support policies and arranged special funds. Li Yan, a Memeber of Nanhai District Committee Standing Committee said that Nanhai will fully support the construction of the project. While helping to build it into the most influential e-sports industry cluster and high-end talent gathering place in the Guangdong-Hong Kong-Macao Greater Bay Area, Nanhai will also promote the integration of traditional cultural resources and e-sports, and create a new field of cultural innovation and cross-border integration. At present, Nanhai has incorporated e-sports competitions and construction of e-sports industry bases into policy support. Nanhai Cultural and Sports Bureau is working on formulating special policies for e-sports industry development, researching and increasing subsidies for construction and operation of e-sports venues, and supporting professional clubs, which has provided guarantee for the e-sports industry to settle in Nanhai.